INDIANAPOLIS—The first graduates of the new Indiana University Lilly Family School of Philanthropy received their degrees on May 12. 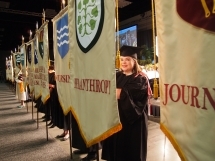 The students, who earned Ph.D., master of arts or bachelor of arts degrees in Philanthropic Studies, were graduated during Indiana University-Purdue University Indianapolis (IUPUI) commencement ceremonies at the Indianapolis Convention Center. The Lilly Family School of Philanthropy is the nation’s first school dedicated to research and teaching about philanthropy. The graduates represent a wide range of experience, from veteran philanthropic sector leaders completing graduate-level programs that expand their knowledge and enhance their careers and organizations to civically engaged undergraduates receiving their first degrees. Several are international, including students from Colombia, China, Japan and South Korea. A diverse array of organizations across the philanthropic sector and around the world will benefit from their expertise. Graduates have earned new positions from coast to coast with organizations such as the American Red Cross, The Nature Conservancy, community foundations in Iowa and Virginia and a private high school serving disadvantaged youth in Tucson, Ariz. Others are continuing their work for Indianapolis nonprofits, including the ExactTarget Foundation, Second Helpings, and the Leukemia and Lymphoma Society. Several students are expanding their education by pursuing advanced degrees. • Jane Chu, president and CEO of the Kauffman Center for the Performing Arts in Kansas City, Mo. • Sarah Nathan, who has accepted a position as assistant professor of philanthropy and nonprofit management at Bay Path College in Longmeadow, Mass. • Tamaki Onishi, who teaches nonprofit management courses in the political science department at the University of North Carolina, Greensboro.